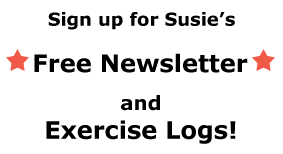 Want to see a great snowball effect? 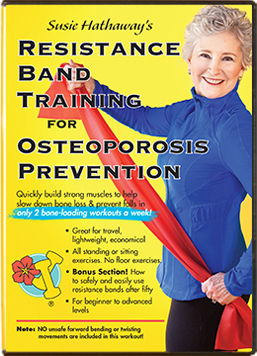 Let’s say that you are a sedentary person who has made a commitment to keep your bones strong and prevent osteoporosis. I have seen over and over that if you take the following steps, you can be vibrantly healthy and fit. 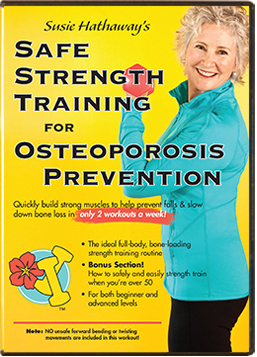 Start with strength training for osteoporosis prevention! –slowly and easily! After strength training for around 3-4 weeks, your muscles will be stronger. I like to look at fitness as a coin, with strength training on one side and aerobic/cardiovascular activities on the other side. Developing muscle strength first will make aerobic exercise much more pleasant and effective. University research studies have proven over and over that consistent strength training, over the months and years, can build bone density, slowly but surely. Add heart-healthy weight-bearing (on your feet) cardiovascular activities, like walking, dancing, hiking, gardening, stair climbing, and skiing in the winter! If you have joint issues and need to stick with non-impact exercise, like swimming and biking, BE SURE TO STRENGTH TRAIN for its research-proven beneficial effect on bone density. Do these exercises with other people to ensure that it happens and for the huge health benefits of social interaction. Find a friend or join a class to do your strength training and heart-healthy physical activities. Give you body nutrient dense foods! Your sense of well-being increases with strength training and aerobics, so people often start making excellent food choices, shunning junk food. Get enough calcium rich foods and Vitamin D for bone health. Balance starts to return with strength gains because of neural adaptations and greater strength. Add a few balance exercises to further these gains. Greater balance leads to fewer falls and less chance of a bone fracture. Stretching after any physical activity will lead to greater flexibility which is helpful in preventing injuries and falls. Start with baby steps. Go slowly, easing into this new, active lifestyle. Start thinking, reading, and talking about it. Try 5 minutes, and then add a minute a day. If you do the above steps, you will get fit!